The “revolutionary” new process could further reduce life-cycle emissions for clean energy technologies. Alcoa and Rio Tinto announced the world's first zero-carbon aluminum smelting process. 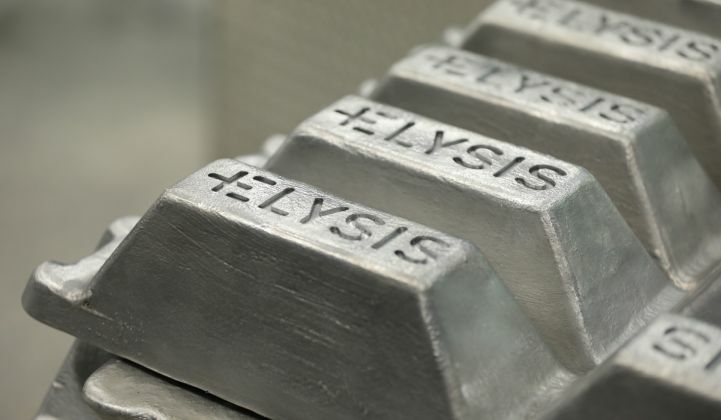 Aluminum production companies Alcoa and Rio Tinto announced Thursday the formation of Elysis, a joint venture company created to commercialize a new aluminum smelting process with no direct greenhouse gas emissions — with backing from tech giant Apple. Standing alongside Canadian Prime Minister Justin Trudeau, the two companies announced the technology, a new headquarters in Montreal, and a research and development facility in the Saguenay-Lac-Saint-Jean region of Quebec. Canada and Quebec will each invest $60 million, with Apple providing $13 million, as well as technical support. Total investment tops out at $188 million. Rio Tinto chief executive Jean-Sébastien Jacques called the new process “revolutionary,” while Alcoa said the technology would have wide-ranging environmental benefits. That includes clean energy technologies such as some energy storage products and solar rooftop racking. Commercial partners who will use the aluminum have yet to be pinned down, but Apple’s collaboration suggests the electronics company will be among the first in line for metal produced with the new technology. The company announced in April that its global operations now run on 100 percent renewable energy, and CEO Tim Cook said Apple looks forward to the day when the technology scales enough for use in the company's products. It’s a spot of positive news for an industry dealing with the fallout of Trump’s latest round of tariffs. In March the administration proposed 10 percent tariffs on aluminum, along with 25 percent tariffs on steel. According to GTM Research, the tariffs for the two metals taken together could add 2 to 4 cents per watt to solar racking prices, increase the levelized costs of energy for wind power by 2 to 3 percent, and bump the LCOEs for solar by 3 to 5 percent. This week, the administration offered Canada and Mexico an initial exemption on those tariffs for an undefined period. The new smelting process — which the companies say will also be called Elysis, in a nod to the electrolysis of alumina used to produce aluminum — uses an inert anode, rather than the carbon anodes used in conventional aluminum smelting. Instead of releasing carbon dioxide, the process Alcoa engineered emits only oxygen. The R&D facility will run on hydropower, further cutting the process’s emissions. According to the joint venture, if Canadian smelters adopt the technology, its carbon benefits would equate to taking 1.8 million cars off the road. Beyond its climate benefits, Elysis said the new production process both cuts operating costs by 15 percent and increases production by 15 percent. Alcoa has refined the process since 2009 at its facility in Pittsburgh, producing about 700 metric tonnes of aluminum. That's a small fraction of what the world currently consumes. China exported 451,000 metric tonnes of unwrought aluminum and aluminum products to the U.S. in April, even with the tariffs in place. Canada produces 3.2 million tonnes a year, with most going to the U.S.
After scaling the technology for industrial use, Elysis expects it to hit the commercial market by 2024. The company plans to license the technology so it can be applied to new builds or used to retrofit active smelters. Elysis also said it will sell proprietary anode and cathode materials. With the new facilities, Canada will be getting “thousands of jobs,” according to Trudeau (Elysis will employ 100 people to start), as well as initial production capacity using the patented process. Elysis said it will also invest up to $40 million in the U.S. to support its supply chain.